In 1907, Akseli Gallen-Kallela moved with his family to the old main building of the Alberga country seat. It belonged to Akseli’s wife Mary’s family as her family seat. 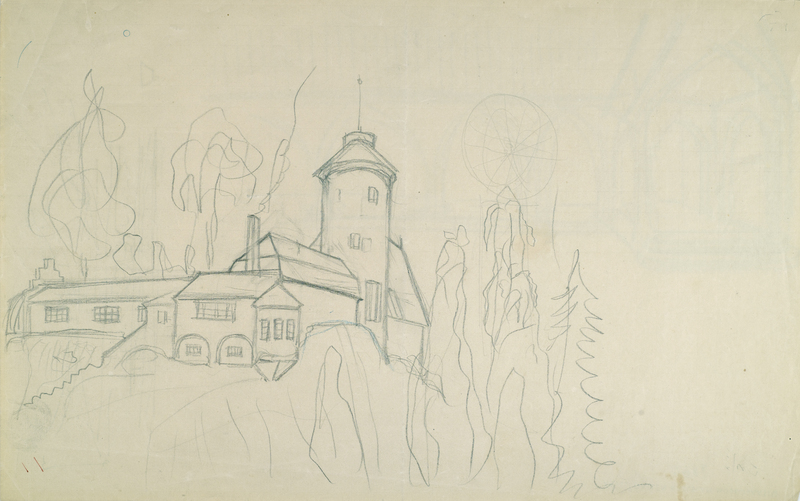 As early as then, the artist had drafted sketches of his studio-to-be, Tarvaspää – a hideaway. Construction of Tarvaspää only got to a start in 1911, when the family returned from their African journey. Point Linudd was split from the estate’s land holdings for the castle-like studio home. 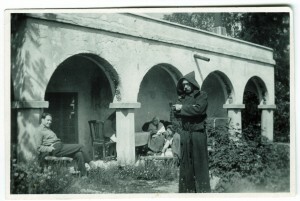 The family moved to the old summer villa of the estate, Villa Linudd, which was revamped for wintry conditions. The studio castle was completed in 1913. In its original guise, it had been designed for artistic purposes. It was heated by means of big hearths in the studio and the gallery. A gallery existed for exhibiting art and throwing parties and social occasions. In the middle tower room, there were items brought from Africa on display. In 1915, Akseli Gallen-Kallela became a quintagenarian. Later in the same year, his family had to leave Tarvaspää and escape the turmoil spread by World War I. They retreated to Kalela in Ruovesi, their first home-and-studio. During the war years, Tarvaspää remained vacant for the most part. Akseli and his son Jorma enlisted in the Independence War among the Whites (as opposed to Reds). Wife Mary and daughter Kirsti stayed most of the time in Kalela or with relatives living in Tampere. Tarvaspää got caught up in the war as a target for looters and once in a while as the scene of a battle. In 1921, as the unrest had settled, Akseli, Mary and Kirsti moved from Ruovesi to Porvoo. Son Jorma had travelled to Continental Europe to study right after the war in 1919. Tarvaspää remained unoccupied, but it was visited every now and then. In 1923, Gallen-Kallela travelled to the Unites States with his assistant Harry Engberg. Mary and Kirsti moved from Porvoo to Tarvaspää. Mary’s mother, Mrs. Aina Slöör, accompanied them in order to avoid the cold and draught of the Alberga estate. 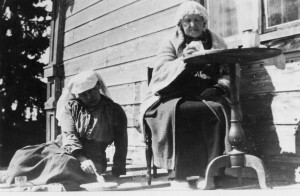 The year 1924 saw Mary and Kirsti follow Akseli to the U.S. Granny Aina Slöör was entrusted with housekeeping duties at Tarvaspää. In 1926, Akseli, Mary and Kirsti returned to Finland. They settled in Tarvaspää. The studio-home was renovated for residential life. It was fitted with plumbing and electricity, a modern bathroom and improved heating. Kitchen would replace the etching room. Between 1926 and 1928, Akseli Gallen-Kallela worked on the frescoes for the National Museum of Finland. Tarvaspää was a permanent residence. Between 1928 and 1930, Akseli Gallen-Kallela focussed on the illustration for an unabridged version of the national epic Kalevala. This work occurred mostly in the tower where a complete concentration on it could prevail. The tower was cool and cold, so Akseli took to wearing a monk’s frock that Mary had made for him. 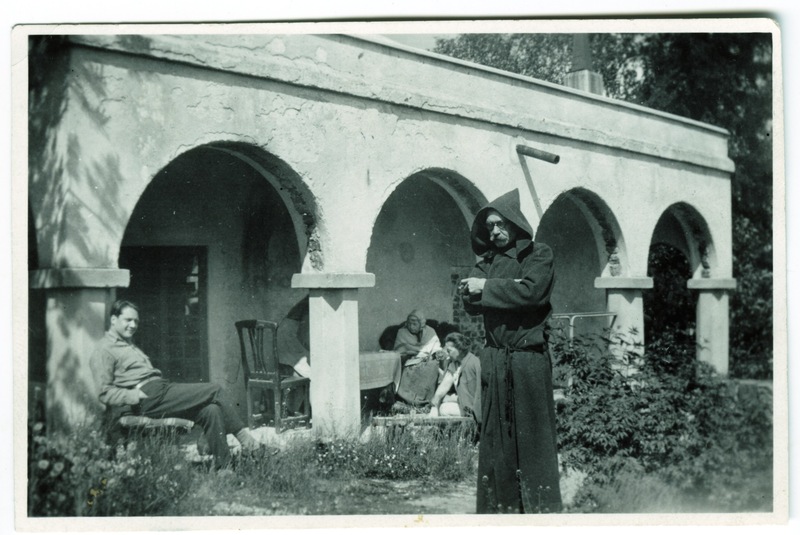 The tower incurred the moniker “monastic chamber”. When the artist had died of pneumonia in 1931, Mary and Kirsti remained in Tarvaspää and lived there. This lasted until 1939, when Mary and Kirsti had to leave due to the Second World War, since the military’s Intelligence and Reconnaissance Dept. used the studio-home occasionally as their base. After the war, Tarvaspää was abandoned. It remained vacant for another 10 years. Children of the area had the delusion that it was a haunted castle. 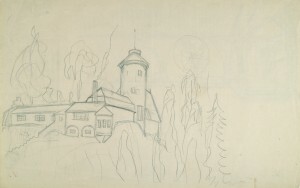 In 1958, the studio-home and Villa Linudd went to the ownership of the Akseli Gallen-Kallela Museum Foundation. The former home became a museum and was stripped to conform to its 1913 exterior and interior. The museum opened to the public in 1961. It had been in the cards, at any rate, ever since the first designs of Tarvaspää were drawn.